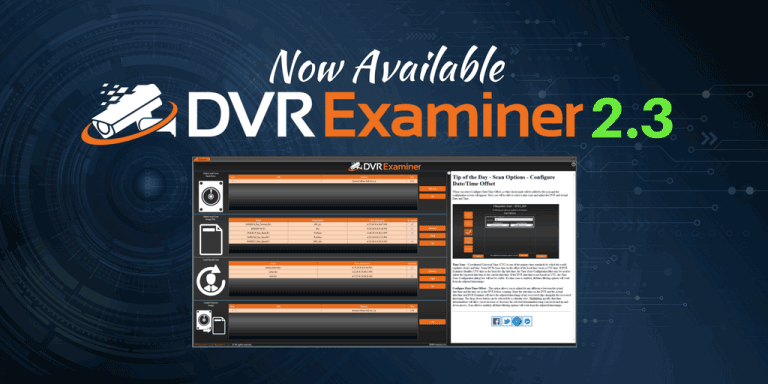 Now Available: DVR Examiner 2.3 - DME Forensics Inc.
Our newest version of DVR Examiner is here, featuring a few prominent design changes and overall performance improvements. This release of DVR Examiner 2.3 includes access to an offline player library for users without consistent access to the internet! One big change you’ll see right away is the new DVR Examiner landing page. This screen will allow you to recover DVR video from the source of your choice without navigating multiple pages. Simply choose a physical disk, forensic image, or saved case, all from the same screen! We are also adding information with tips and tricks to help you get the most of DVR Examiner. Offline Player Library: Users working on non-web connected machines will be able to access proprietary players without having to go to a web connected workstation. Updated Tag Features: Users can now sort through the clip list based on specific tags of your choice. Clip List Performance Improvements: We have updated the clip list to help you sort through clips faster and more efficiently. We look forward to your feedback on these changes!